If your TM5 Thermomix mixer bowl hasn’t been put back together properly and you accidentally pour liquid into your machine, these are the steps you should do if you flood your machine. Immediately turn off your machine and leave it off for a minimum 48hrs or until Technical Support tell you to turn it back on. DO NOT TIP YOUR TM5 ON ITS BACK. Use paper towel to clean up as much liquid as you can. Call Thermomix Technical Support on 1800 004 838 (Weekdays 8am – 5pm). Customer service are fantastic to deal with and they will talk you through a troubleshooting process. To help avoid flooding your TM5 in the future, it is a good idea to only put the mixer bowl back fully assembled and leave the base of the mixer bowl upside down in the Thermomix, until the bowl is finished being cleaned. 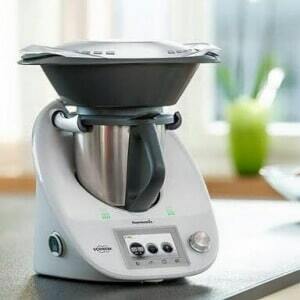 “Thermomix” is a registered trade mark of Vorwerk International AG (Vorwerk) in Australia & New Zealand and Thermomix in Australia Pty Ltd (Thermomix in Australia) is its authorised user and exclusive distributor in Australia and New Zealand of Thermomix products. Neither company supports, authorises or endorses this site”.